An aneurysm is a sac, or outpouching, that develops in the wall of an artery. When the walls of an artery are weakened, the pressure of blood flow through the artery can cause the weak spot to balloon out and fill with blood, further thinning the arterial wall. Aneurysms may be caused by a genetic weakness in the artery or by degeneration of the artery caused by infection, injury, or hypertension. Over time, the wall of the aneurysm may become so thin that it ruptures. When a vessel ruptures in the space containing cerebrospinal fluid that surrounds the brain, this condition is called subarachnoid hemorrhage; it is a neurological emergency that is responsible for almost one fourth of all deaths due to nervous system disorders. The most characteristic symptom of subarachnoid hemorrhage is sudden severe headache, unlike anything the patient has ever experienced, and may be accompanied by neck pain, nausea, or visual disturbances. The risk of aneurysm rupture peaks between the ages of 55 and 60, even though the aneurysm itself may have been present since childhood. 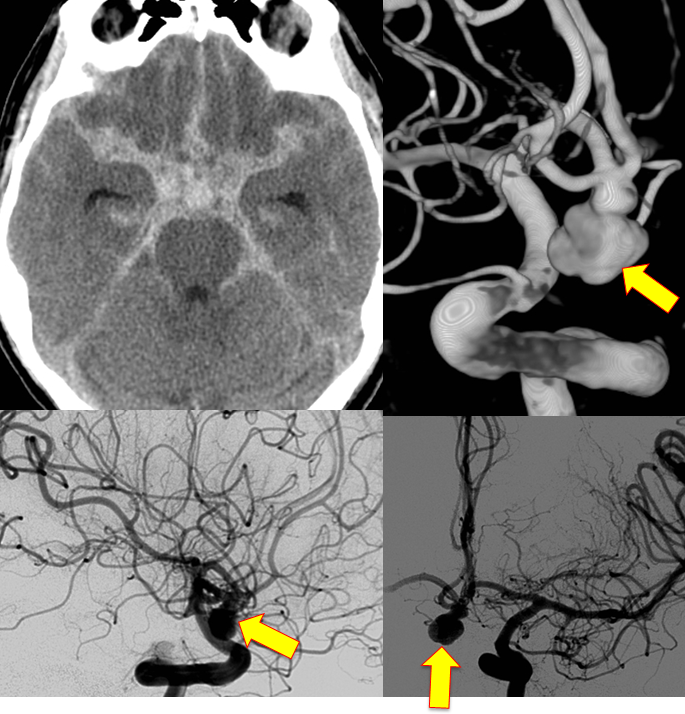 Aneurysms and subarachnoid hemorrhage can be identified and assessed with computed tomographic (CT) scanning and four-vessel cerebral angiography. Further diagnostic information can be obtained through cerebral blood flow studies, spinal angiography, magnetic resonance imaging (MRI), and CT angiography. With these images and tests, neurologists can determine the best course of treatment. Subarachnoid hemorrhage associated with aneurysmal rupture has a high mortality rate-8 to 15 percent in the first 24 hours and 66 percent by 1 to 2 months after rupture. The goal of treatment is to stop the bleeding, seal off the aneurysm from the rest of the circulatory system, and preserve brain function. Patients often are given medication, including painkillers, anticonvulsants, and antifibrinolytic agents to treat bleeding. Surgical treatment of aneurysm is designed to seal off the sac to allow blood to flow past it normally. The two primary techniques used today are clipping and coiling. Clipping, the more established of the two treatments, involves the use of a special clip to seal off the neck of the aneurysm. Coiling is an endovascular procedure in which a catheter is inserted into an artery in the groin and guided up through the blood vessels to the site of the aneurysm. Once in place, the tube releases a small platinum coil into the aneurysm, which causes the blood in the sac to clot, blocking circulating blood from entering the sac. Aneurysms are complex lesions, and should be addressed at major centers with experts experienced in their treatment.